As I finished my Chronological Bible reading for 2016 with the book of Revelation this morning, I was overwhelmed by God’s holiness and perfect orchestration of His majesty. Over the past few months I have struggled with this nagging concern that I miss the bigger picture of God’s holiness. The book of Revelation drove this bone marrow deep. Learning, searching His Word, praying… yes…I want to know more of His holiness this year. What does it mean to choose a word for a new year? I prayerfully select a word that I feel the Lord is drawing my attention toward. Maybe it’s an area of my life or my heart in which He wants to prune or shape. Maybe it’s a need He wants me to recognize and He desires to fill with Himself. It may be something about Himself He wants to reveal to me. The Lord and I choose a word, and I toss the list of New Year’s resolutions away. I want God to form my character at a deeper level, a sustainable level this year. I search Scripture for the word. When is the word used? Where is it used in the Bible? How is it used? Who is uses it? Why is it used in the context it is? Selecting a word demands greater focus for me. It requires intentionality. The word “holiness” will become the lens through which I examine my heart and my life for an entire year. The book My One Word by Ashcroft and Olsen has been a tremendous tool over the last couple of years. The goal of the My One Word project is ultimately a transformed heart. My One Word journey this year is holiness. According to Ashcroft and Olsen, “The aim is for you to use your one word to get into a focused posture and remain there while you depend on Christ. Change is possible. Focus is required.” I am focussing on God’s ability to do in me what I cannot do for myself. My prayer is for a greater realization of what is holy and what is unholy. My prayer is for a deeper need for Him in my day, in my life…and wisdom. Did you have a word for 2016? My word this year was JOY! What is your 2017 word? I have a dark…bibliophile-esque secret. I admitted it. As of today, there are roughly…give or take a few… 500 books sitting comfortably on my cloud… Enjoying each other’s company and waiting patiently for their reader chick to get to them. One such title is The Insanity of God by Nick Ripkin. I downloaded the book in October of 2013. I thought I had read it…until I saw the movie this week with my hubby and friends. I had not. I would have been dramatically wrecked if I had read this book. The movie was released in association with the IMB ( International Mission Board) in limited theaters last Tuesday, August 30th. It is the first theatrical release from LifeWay Films. The Insanity of God is the true story of missionaries Nik and Ruth Ripkin and their journey into the persecuted church. The Ripkins share their story of how persecuted believers taught them to love Jesus, how to follow Him, and how to walk with Him day to day even when it doesn’t make sense. Being the mom of young people who are serving the Lord on the international mission field, I was shattered by the depths of love of these people for Jesus. 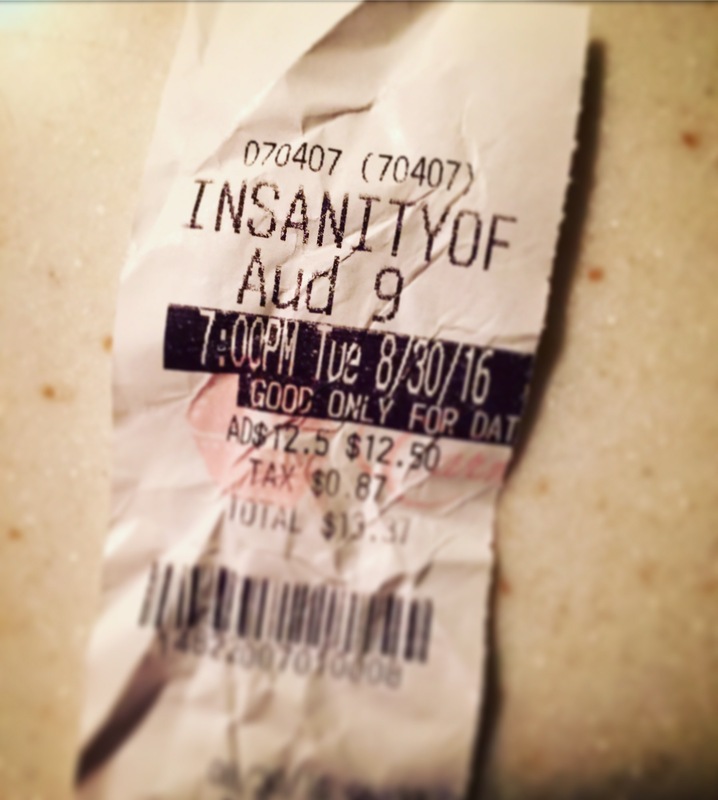 Convicted and humbled, I left the theater with a desire to serve Jesus more faithfully. To love Him more… To love the lost…enough to do something beyond just words. The movie is going to be shown in theaters again on September 13th. If you have the opportunity… GO. May is mayhem month within my circle. Each May we celebrate our wedding anniversary, Mother’s Day, and the end of another school year. As a teacher, I add my own brand of crazy to the May mix which means graduations, final grades, parties, field days, and post planning. The month is one long blur of activity, but June tiptoes in for such a sweet change. Bear and I spent the first weekend of May at the beach celebrating our 34th wedding anniversary. My beach of choice is Jekyll Island, Georgia. In all honesty, it’s not the pearly white sands and clear blue water of Florida’s gulf, but it is quiet and fairly close. There is history. There is quiet and rest. There are sea turtles. AND it is not a ridiculously long drive to get there. That’s big in my book. Everything’s better at the beach, I do believe. Mexi-Mahi and shrimp tacos, long walks, reading on the beach, and a quirky little book store. The weekend was perfect! Well, May had me searching for new breakfast foods since my local Kroger has decided to only stock our favorite whole grain, low carb English muffin in minute quantities (I mean…small, ya’ll!) I swear! Bear and I are like the bread nazis about this particular brand of English muffins because when we do see them on the shelf we grab two or three packages. We are almost bread bandits…We practically stalk the poor bread guy, and we are hitting the store several times a week looking for the silly things (which may be part of Kroger’s evil plan of world dominance- I knew bread would be our downfall.) I will not mention the name of “said” English muffins because. duh… I don’t need more people flocking to the local Kroger and taking the muffins from my paws. TRUTH! I am not a trend follower so this idea of uncooked oats (the real point behind my rabbit chasing tirade) mixed with yummy, healthy stuff in a jar for breakfast is probably on its way out, but WOW! Oh my goodness! I love this idea. Over Night Oats have become my new breakfast run-to. And it’s perfect for summer, I might add. Throw the ingredients in a jar the night before, shake it up, and refrigerate! Delicious, light, healthy, easy…no cooking! All of the things I love about food prep! Hey! Don’t judge my oats! I know they are not shown here in the prettiest, most “Pinteresty” manner, but they are good. Pinterest is loaded with hundreds of recipe/oat combinations. This just happens to be a yummy blueberry pineapple version of the basic recipe. It is made with Chobani’s pineapple Greek yogurt and fresh blueberries. Some people add some type of sweetener such as sugar, honey, etc… I don’t. I am not one who usually likes sweet foods for breakfast (Except for PANCAKES…but that’s another post all together…). Remember to play with the recipe. The amounts I have listed work for me and my taste. I add the ingredients to a wide mouthed mason jar (or any dish with a lid that seals ) and shake or stir to mix. Stick that baby in the refrigerator over night and breakfast is handled. BUT…when I can find my English muffins…well. you. know. In spite of the fact that Mayhem May was…CRAZY, I managed to complete a couple of books. Later this week I will spend some serious time sharing these in detail, but this one…is KILLING me softly. (In a “beautifully bruise my toes and pierce my heart kind of way!) Lisa Whittle! Oh my heart! Girl! I am officially a soul sister fan! I haven’t finished I Want God yet because I am using it as part of my morning quiet time with my Chronological Bible reading. This isn’t going to be one I rush through. There have been some seriously deep Jesus moments with this book where I just had to stop, sit in silence, pray, and pour my heart out in my journal. The big question the Lord is whispering over me is, “Do you WANT me, Berta? Really want me? Because you can’t want your comfortable safe life and want ME at the same time.” Heavy. Sigh. Life is looking pretty sweet…simpler…for at least June and July.